I am pleased to have two poems appear in the inaugural issue of Aperçus Quarterly. The poetry section features fine poems by colleagues and mentors such as Boyd W. Benson, Cameron Scott, Marvin Bell, and Peter Sears. The collection is a manageable size, and each poem is worth a read. The images beneath each poem are also striking, evocative, and well-chosen to compliment the written piece. 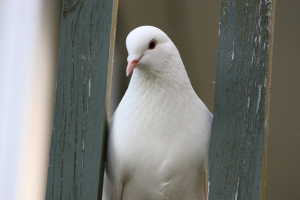 I wrote the poem “White Pigeons” while still in Ojai. There is a coop nearby my parents’ house. Re-reading the poem from my office in Soho makes me homesick for a place that now seems so far away as to almost have been imagined. It is, for me, a pleasant kind of haunting. Enjoy the poems. or the old women of silken bones. I could not remember dreams. and a mouth feel the song in it. the bones home, regiment by regiment.